One hundred years ago, there lived a Christmas of blood. In 1917, the territory of the municipality of Conco was crossed by thousands of soldiers headed in the first line of the Val Ciama. One hundred years ago, on the border of our common, ended the austro-Hungarian advance after Caporetto. The exhibition shows what was "100 years here." From 23 December to 6 January 2017 2018, at the Town Hall in piazza San Marco in Venice, will be an exhibition "100 YEARS HERE." 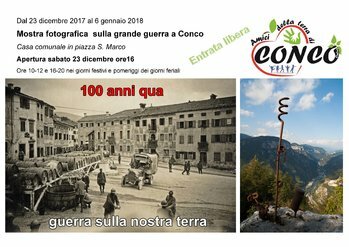 This is an interesting photo exhibition that wants to remember, through numerous vintage shots, the tragic events that shook the country of Conco and the entirePlateau during the great war ; in a nutshell, a view not to forget. Theinauguration of the exhibition will be held on Saturday 23 December 2017 at 16.00 hours.